Platinum Games show the Vanqush Suit that could’ve been. And transforming robot dogs.. So I’ve been in Germany lately, and irritatingly missed that amazing Vanquish trailer posted here last week. I really can’t wait to get my hands on the finished product. Sadly there’s a lot it seems didn’t actually make it into the final game, as illustrated by the awesome concept art in the latest developer update on the Vanquish Blog. Apparently a few ideas were tossed around during production about how Gideon’s suit could transform, into either different shapes or combine with a female partner android who could form into an enormous gun or be flung like a boomerang (I really enjoy the thought of that one). These didn’t make it too far, but there was also an idea concerning a robotic dog as a support character (Much like Casshern’s ‘Friender’) which made it all the way to the modelling phase, leading to the concept art you see above. There’s a full hi-res version on the blog so be sure to check it out, as the design is really pretty incredible. I completely understand why they didn’t go along with the idea, because with the pace of the game as it is now, trying to command or keep track of an AI partner would surely prove to be a bit of a challenge. Still, it’s such a cool design that I hope it at least gets some kind of cameo in the game proper. HOLY CRAP. 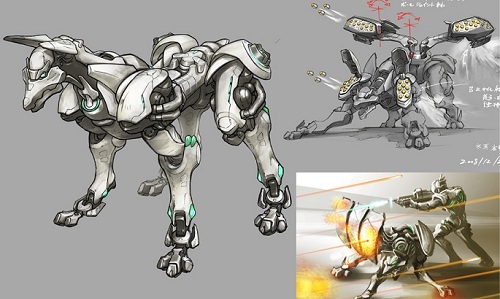 I’m totally psyched for Vanquish already, but if it had the robo-attack-dog, I’d buy three copies! Man I hope they implement this into SOMETHING in the future. I love the way you could use your dog for cover. If only you could do that in Fable II. ROBOPUPPY PREPARING TO LICK CHEEK, ROBOPUPPY COMMENCING CHEEK LICKING, LICKING IN PROGRESS, LICKING COMPLETE.